The Salmon Lodge is a West Bend luxury 3-bedroom, 3-bath townhome in the Old Mill District, offering a location that allows you to walk or bike everywhere! Mountain view from upstairs deck with attached bar. This townhome sleeps 6 to 9 guests and, to ensure you can take full advantage of the Bend lifestyle, they provide two canoes and four sets snowshoes for your use. 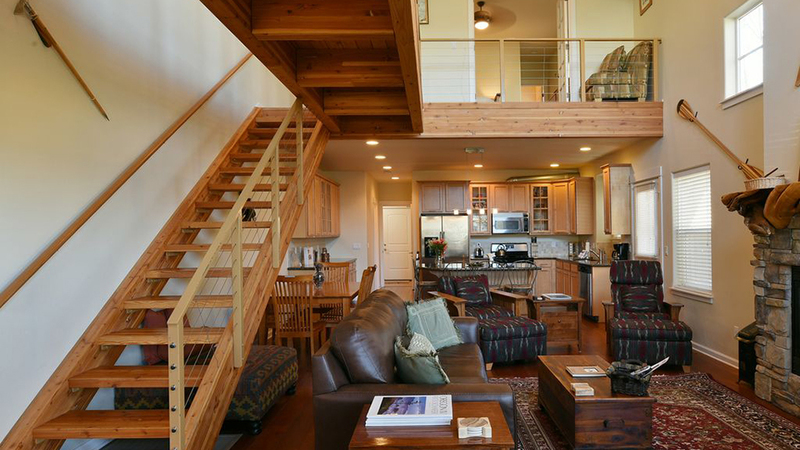 The Salmon Lodge is a 1,900 square-foot townhome offering competitive rates, including discounted weekly and monthly rates. The downstairs is dominated by a luxurious great room that includes a fully equipped gourmet kitchen, two-story dining and living area with architectural rock and natural wood and 33 windows let in the year-round sun. Enjoy a second-floor exterior deck that offers stunning views of the Cascades. All three bedrooms enjoy a dedicated full bath that is either in-suite or adjacent. The five beds include a king (in the luxury master suite), two queens in bedrooms, a queen sleeper sofa in the great room, and a twin futon bed in the loft for a total sleeping capacity of six to nine. A portable crib and baby gates for the top and bottom of the stairs are also provided. Adjacent to the house is a modest fenced area with a patio, second outdoor table and gas grill and there’s a two-car garage behind the Salmon Lodge is entered from a private alley.